One of the most visited historical site of Ayutthaya, Wat Chaiwattanaram rests on the bank of the Chao Phraya river, to the west of the city island. The temple was ordered to built in 1630 by King Prasat Thong to honor his mother, featuring the architectural style influenced by Angkor temple in Cambodia. Its unique feature is a large, central prang (Khmer-style pagoda) surrounded by smaller prangs, symbolizing Mount Sumeru, the gods’ mountain according to Hindu belief. The lighting at night makes the temple even more exotic and beautiful. Short Description: Wat Chaiwatthanaram is a Buddhist temple in the city of Ayutthaya Historical Park, Thailand, on the west bank of the Chao Phraya River, outside Ayutthaya island. 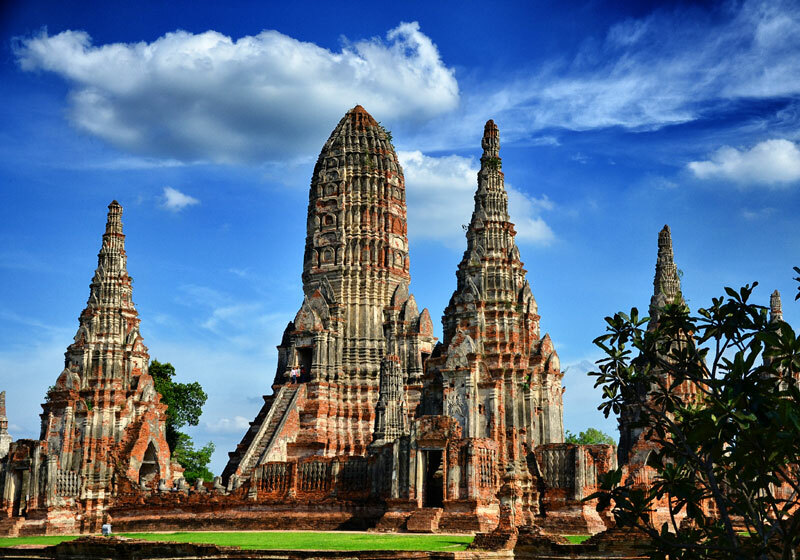 It is one of Ayutthaya's best known temples and a major tourist attraction.